It is not a secret that majority of the games are decided in the middlegame. Nevertheless, most chess players focus on everything else but not on the middlegame itself. They study openings, drill tactics and memorize the endings.Wouldn’t it make more sense to focus on something that actually decides most of the games? Indeed. But there is a problem... 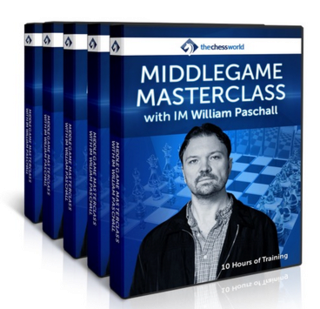 While openings and tactics are relatively easy to train, the middlegame is very different. It’s not enough to just solve many problems or to memorize the lines… To become a strong middlegame player you need to have a good grasp on fundamental principles. Things get harder, because most pieces are still on the board. Thus, memorization isn’t an option. We will start learning the static concepts and work our way to the dynamic ones. In the first several chapters we will start with pawn structure, then continue with strategic concepts laid out by Nimzowitsch, and then proceed with coordination of pieces and pawns, space advantage, exchanges, king’s safety and so on. While your opponent stares at the board trying to figure out why he is losing, you can relax and just enjoy the game. The question won’t be whether you can win or not… but rather how soon that will happen.Trust me it is a much better position to be in! It not just takes the stress out of your game, but also gives you an instant confidence booster. First download all parts and put them in the same folder before you try to extract. Now use 7-Zip or Winrar to extract part 001 and the rest will extract automatically. You do not need to extract part 002.